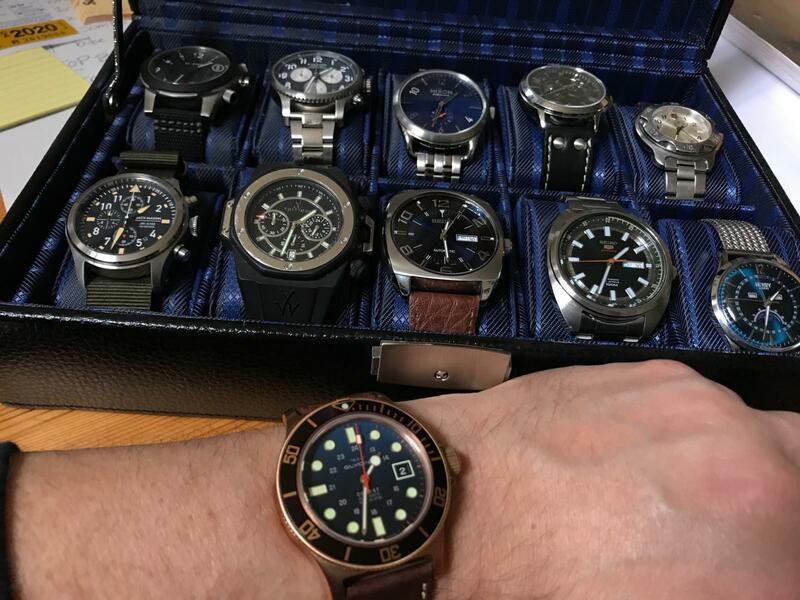 Just spent my first early March day/date adjustment on my very modest collection of a dozen or so watches (I have my two non-complication skeletons in the winder closets). Thought it was gonna be a chore, but turned out to be a delight while watching the combine on the iPad. Great way to spend a bit of a rainy day off. nice pieces in there. An older Swiss Army and Seiko. in the front far left row, what brand and model is that? Thanks Scott. It's a Jack Mason Aviator chronograph JM-A102; it's a Japanese quartz that I use for the gym as it's light, thin and easy to read and the nato strap dries quick after the spa. Really does sound like a terrific time, along with day doing that ! already ! ..Thanks so much for the post !! !